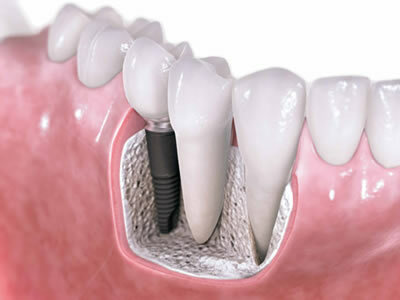 Dental Implants are today’s best solution for replacing missing teeth. They are strong titanium screws that get inserted into your jawbone in place of the missing tooth to act as an artificial root for restorations, such as dental crowns or dentures. Dental Implants serve in preserving your bone structure, keeping your adjacent teeth in place and supporting the artificial tooth in a strong, stable and durable way. You’ll be happy with having two full, straight sets of teeth that look naturally beautiful and function just like natural teeth. This small surgical procedure will give you your confidence back to smile, speak and chew comfortably.